As war and hunger rages in South Sudan, Great Commission Media Ministries is on the front lines of Gospel-centered ministry. Fear grips this country as the outpouring of poverty, conflict, and bloodshed continues. We united with pastors, churches, and volunteers to bring a message of reconciliation and peace to this hurting nation. By the grace of God, South Sudan is experiencing hope as the most hopeful change in recent history. God is bringing aid to families, women, and children through our Mega City Campaign which features two important outreaches. One of our team members told of a man who had not eaten food for three days. 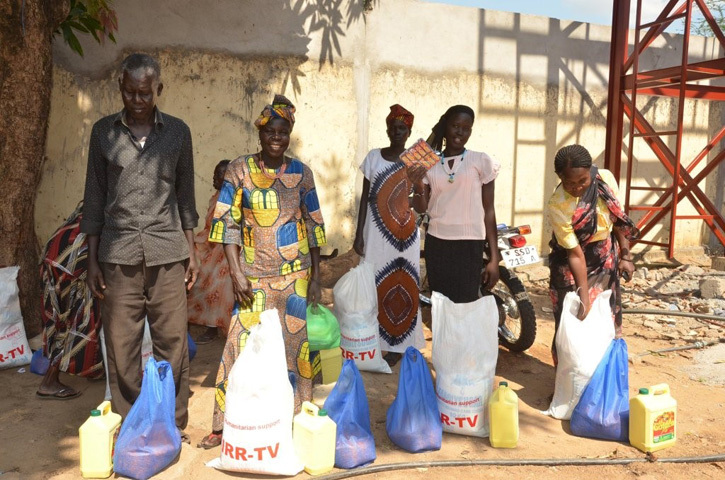 South Sudan’s long-time famine presented an amazing opportunity to provide much-needed food. Moved to help, local campaign volunteers were thrown a barbecue party. The people’s hands trembled while eating. They had a hard time believing they had meat in their hands. They said they had not eaten meat for many months and did not remember what it tasted like. We’re also providing food, such as corn and rice, as well as hygiene supplies and medicine. Medicines are acquired from Kenya and Uganda, as pharmacies were destroyed in South Sudan during the war. The distribution of the grant is handled by the Council of Churches of Southern Sudan. Our campaign to proclaim reconciliation in South Sudan has produced much fruit since the beginning of November 2018. Even the President has become involved in the outreach! His speech about the campaign and reconciliation was broadcast live on TV to about 6 million South Sudanese. Additionally, we’re airing messages two to four times a day on the radio and TV that talk about forgiveness through the Gospel. Viewers can respond to the campaign by calling and requesting their free evangelistic book containing testimonies of South Sudanese people who have been transformed by God. The impact is huge right now! Interest is so massive that our call centers are continually congested. Up to hundreds of thousands of calls have been missed, and we are working hard to follow up with the overwhelming responses. Why is this an answer to prayer? God is moving so much in South Sudan that people don’t want to wait for forgiveness! When they see stories on the TV or listen to them on the radio, it causes them to want to forgive and receive forgiveness. Our prayer is that we would get more resources that will strengthen us to provide more help to South Sudan. You can participate in this evangelistic outreach by donating to GCM Ministries. We have needs for more Power to Forgive Evangelistic Books. Each book can lead many to faith in Jesus Christ.